Your implants are the foundation of a great breast augmentation. They can make or break how happy you are with the final look of your breasts. However, choosing a breast implant has many facets, all of which work together to create the look and feel of your breasts. The ideal implant for your breast augmentation can be determined after a thorough consultation with a qualified surgeon, but understanding your options is a significant step to ensure that you achieve the best results possible. The material you choose for your breast implants will impact the overall look and feel of your breasts. However, the thickness of your breast tissue and ideal incision location may also affect which implant material you choose. Saline Implants – FDA approved for use in women 18 years or older, saline implants are a silicone shell that is filled with a saltwater solution. Saline implants can be filled during surgery for a truly customizable size. However, visible rippling of saline implants is more common in women with thinner breast tissue. 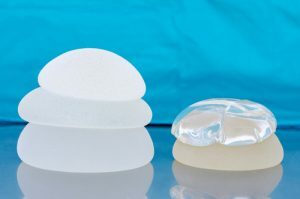 Silicone Implants – Silicone implants are FDA approved for women 22 years or older and are comprised of a cohesive silicone gel that is form-stable. Silicone implants may be preferred because they simulate breasts that look and feel natural in many women. However, silicone implants can be more expensive, and incision options are more limited. Round implants are wider at the sides and more narrow at the top and bottom, whereas tear-shaped, anatomical implants resemble the natural shape of breast tissue by being more narrow at the upper pole and full at the base. Factors such as your breast tissue thickness and chest width can impact the type of shape you should choose for your implants. For this reason, it is important to discuss your aesthetic concerns with your surgeon, who can suggest a shape that is best for you based on your anatomic realities. Textured implants are typically used in patients who have a history of capsular contracture during implant revision surgery. Most women don’t choose textured implants because they can cause surface irregularities if you don’t have proper breast tissue thickness. Unless you have a particular breast need that has to be met, you will probably utilize smooth breast implants. Size is unique to you. Determining the best implant size for your surgery is a balance between your body’s build and your aesthetic goals. Two women who are wanting the same size breasts can have implants that are sized differently depending on their chest width and the amount of existing breast tissue. Your surgeon will evaluate your needs during your consultation and will make a size recommendation based on your desires. For more information on implants or breast augmentation techniques, contact Dr. Green’s office today. You can schedule a consultation with our board-certified plastic surgeon to discuss your breast augmentation options. Call our office at (916) 929-1833, or you can contact us online.